About one third of Turkey is underlain by carbonate rocks. The intense karstification is spread almost all over Turkey. 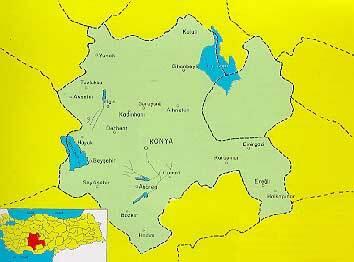 It is found particularly in the regions of the Taurus Mountain Range, in Northwest Anatolia, in Konya closed basin and in Southeastern Anatolia. Karstification is present both at high altitudes (over 2000 m.) and also it is known to exist at elevations below the sea level, such as Ovacik submarine springs, Kas – Kalkan submarine springs and the Mediterranean region coastal springs. According to Eroskay and Günay (1979), four karst regions can be differentiated in Turkey Taurus region, Central Anatolia region Southern Anatolia region, and Northwest Anatolia and Thrace region. Taurus Region: This is the most important and largest karst region in Turkey. Taurus mountain ridges can be identified as the Alp’s extension in Anatolia. It begins at the Aegean coast, continues through northeast of the Mediterranean sea to Iran and over eastern Anatolia. In this region between the Mediterranean coast and central Anatolia the width of carbonate units is mostly 200 km along the Taurus mountains, and the peaks of the sharp limestone hills are as high as 2500-3000 meters. The stratigraphy of the region contains different units from Cambrian to recent age. There are some parotocton metamorphits. Mesozoic limestones and dolomites occur in over 1000 m. thick layers. The evolution of the ophiolitic melange in the Late Cretaceous exists as an impervious base or cover according to the stratigraphical and structural position of the carbonate units. Important caves mostly exist along these contact lines. Central Anatolia Region: Central Anatolian region, which is located in the north of Taurus belt, seems a typical closed basin, morphologically bounded with high mountains. The average elevation is around 1200 m. The recrystallized hard limestones of Jurrasic and Crataceous age, which bounded the basin on the south and west, are the extension of Taurus. The ophiolite settlement in the late Crataceous overlies the older carbonate units. The Neogene units, which cover large areas in the basin, are mostly on ophiolitic basement. Sometimes they are in contact with older limestones. Neogene limestone is locally called as Obruk limestone. The collapsed dolines in the basin which are called obruk, are the typical karst features. Southeast Anatolia Region: Considering the regional geology at the south of the Taurus belt, marginal folds and stable platforms units have been differentiated. In the marginal folds belt, karst has been developed mostly in the Midyat limestone of Eocen age. Gercüs or older impervious units underlie the Midyat limestone, as Korudag uplift. Sometimes carbonates of Mardin group of Cretaceous age crop out. Stable platform units are located at the south of marginal folds. It is the typical plateau-shaped smooth area of southeast Anatolia. In these region, large caves like the Taurus belt are rare. Northwest Anatolia and Thrace Region: In these region, limestone blocks covers limited areas when compared with other regions. In the Thrace part, Eocen limestone which lies along the southern margin of Istranca massif, Aegean part, Permian- Mesozoic limestones which overlie the older metamorphic massifs and Western Black Sea part Jurassic-Cretaceous flysch formations are important karstic units. Extracted from Günay – Eroskay (1979). “Turkish Cave Research Association” has been established on April 1964. Activities has been carried under basic principles and aims such as general research, classification, scientific studies and touristic visits. Between the years 1964 – 1980 while representation of Turkey has been made at the international speleology platforms, also research activities has been undertaken with the French, Italian and English. In the meantime, as the Association we have participated in the activities carried at Cennet, Cehennem, Insuyu, Narlikuyu, Damlatas and Yalandünya caves to be opened to tourism. 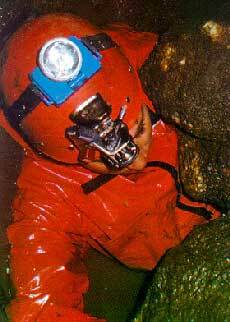 After 1980, researches were made with more weight given to the sports side of caving. During this term, more than fifty caves have been taken under research, maps have been prepared and the majority of these researches and activities has been published in the Association’s bulletin. Furthermore, these activities have been made public through the exhibitions and meeting, conferences and with this aim, together with the Turkish Radio Television-TRT – Documentary of the Turkish Caves; Altinbesik, Indere, Tulumtas caves documentary programmes has been prepared. Right now, activities are being carried at the Central Taurus mountain region range. 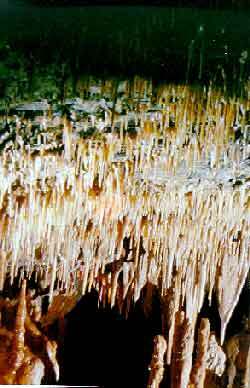 The Cave Research Project, operating since 1979 under the Directorate of the Institute of Mineral Research (M.T.A. 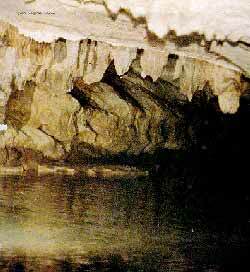 ), has completed the study of 150 caves of various sizes, despite shortages in personnel and equipment. The goal of the project is to determine the economical potential of caves rather than discovering the largest ones. The other aim is to form an inventory of Turkish caves.In accordance with the goals mentioned above, most of the research is concentrated in touristical areas or in karstic regions affected by water shortage. is a club formed by the students of the university. 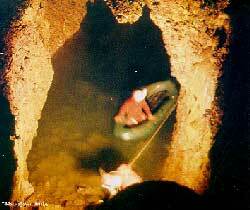 Activities are pursued on both sportive and scientific aspects of speleology for over 16 years. Though their study focuses mostly on the Zonguldak – Kastamonu region. They are also exploring and surveying caves in other regions of Turkey. Until now, over 80 unknown caves are explored. The cave is located near Ürünlü Village, 7 km from Ibradi Village in Akseki – Antalya. From Antalya to Ibradi you can go through highway. The way between Ibradi and Ürünlü is stabilized. You can also arrive to cave by a 5 km. away from village to Manavgat River. The water which comes from Büyükdüden, Oruçdüdeni and Feyzullah Düdeni is discharged to Manavgat River by Altinbesik Cave.The examined part of cave is 2200 m. The cave begins with a lake from the entrance. 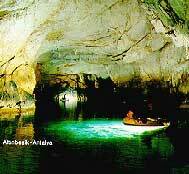 The lake’s length is 125 m. The depth of cave reaches 15 m. in some parts. In the mid part of lake there is a natural bridge. First lake ends at the nearly vertical travertine barrier which has 44 m. height. There are also 2 lakes on the travertine. After the travertene the cave goes with 3 branches and the active branch was examined up to a hole of 8 m. height. 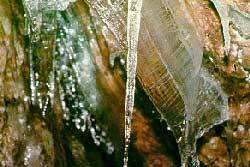 The cave was covered with travertene and fissures completely, except the fossil branch. Main conduit is supposed be at the end of first lake. The sinkhole is located at the southwest margin of Akseki Polje. It could be reached by the Pathway from the fourth km. of Akseki – Bucakkisla main road. The sinkhole has many lakes and it ends with a siphon. Total depth of the cave is -155 m.
It is possible to reach Kocain Cave by Karatas – Camiliköy – Ahirtas Village road which is branched from Burdur-Antalya highway at least 20 km away from Antalya city. The cave is on the 45 km. north of Antalya at Indag Mountain. It is a huge chamber (600 m in length. 50-60 m in height). The entrance diameter of the cave is 35×70 m. Kocain Cave has also prehistorical traces from Roman times. Biyikli is one of the biggest sinkhole in Turkey. It is to the Biyikli Village at 30km north of Antalya city. The water which sinks in Biyikli, emerges the from Kirkgöz springs located at 2.5km northwest of sinkhole. The water sink in the siphon is remerges from Varsak doline which is located 15km southeast. The cave is located at the neighborhood of Oymapinar Dam on Manavgat river. It is found by coincidence in the gallery excavations. The cave is active and has a total length of 7 km. It is the largest known cave in Turkey which is formed in conglomerate. 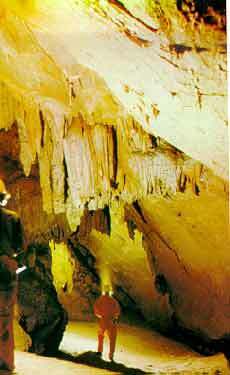 Molla Deligi cave is located at the eastern Side of Tahtali Mountain (West of Kemer Town). Cave includes several horizontal passages.There is a siphon at the end of main passage. The other passages are narrow.Total length of the cave is 549 m. It is an active cave in wet seasons due to water level fluctuations. Ayvaini is located at the vicinity of Ayva Village (Bursa). It is an active river cave. It is possible to enter the cave from Doganalan entrance with -17km descend and exit from another point which is at 1 km southwest. of Ayva Village. 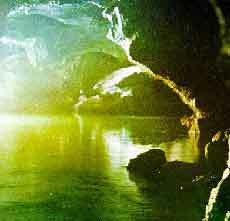 The cave includes many lakes, in spite of increasing water it can be passed even at spring time. It is situated at the 11km. west of the Yenisarbademli town of Isparta. It can be reached through Yenisarbademli or Egirdir – Yenice. It is now the longest cave of Turkey with its length of 12 km. which was reached in 1991. It is one of the most important caves the world its height exceeding +60 m. (survey is not completed) It has active passages and cascades. Water temperature is extremely low (+4 -5 C). Incesu cave system is situated at 7 km. south of Taskale town 45 km. far from Karaman province in southeast direction. The site is arrivable by all means of transportation facilities. The system is formed by two continuous separate caves. 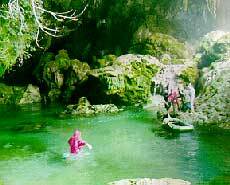 The horizontally extending caves are richfull with stalactive and stalagmite formations. One can follow an underground river in wet seasons from Incesu cave (1356 m.) to Asarini cave (750 m.) despite it has been closed by collapsed blocks. Hislayik Cave is in Ayranci town of Karaman city. It is descended to an underground river with a 26m pit. The cave is separated to the two side to left and right. Each passage is starting with the siphon and continues with siphons. The exploration of this cave continues. Total length of the cave is 260m till the 1990. The cave is situated in Sarpunalinca quarter of Senlik Village of Devrekani near Küre District of Kastamonu Province. It is reached through Küre – Sarpunalinca forest road. The cave drain water accumulated in Sarpunalinca district. The cave is totally horizontal and has a length of 662 m. An underground stream passes through the cave along a joint plane. It has a nice camp site near entrance. The cave is located in Derebucak village borders in Cide – Kastamonu. Once can reach the cave by walking approximately 5 hours from Derebucak to the NE direction. The total length is 860m. and depth is -250m. The cave has two parts: horizontal part is fossil and the vertical part is active. Water cisterns and leftovers of houses from Roman – Byzantium period can be found at the entrance of cave. Also you can find a way, which is established from 24 spiral and covered with hand made stone, at the beginning of vertical part. By taking this way, one can reach a pit whose depth is 52m. and diameter is 30m. 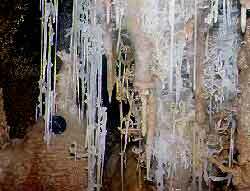 After this you can reach a siphon whose floor is covered with travertine and very nice formations look like chandelier. It is hard to access to some branches because of their elevations from main passage. In these parts ornamentations are protected up to today. The technical equipment is required in the vertical part. The cave is located at 5-6 km SW of Sarpdere Village of Demirköy, Kirklareli. One can arrive at cave with jeep or tractor. The cave has 3 entrances. The total length is 3200 m. The first 1000m. from the entrance is active. The fountain originated from the cave, is establishing Rezve River. This river is also the border between Turkey and Bulgaria. One of the entrance is Dupnisa Dolin entrance. The second entrance is dry cave. Dry cave begins with two different entrances one of them is 363m and the other one is 456m. The third entrance called Kiz Cave and begins with a slope of 60 degree. The side branches of cave is fossil and the main system is active. In the cave there is a hole which has dimensions 150x60m. The cave is located with in the borders of Çamlik Village and Derebucak district in Beysehir – Konya you can arrive at cave by stabilized way, branched from 45 km of Konya – Beysehir – Üzümlü – Manavgat. The cave is situated 5 km far from Çamlik and 6 km from Derebucak. It is also 3 km northwest of Körükini and Suluin caves. down 2km south, from a cracked valley border, slope of Uzunsu river side. Balatini Cave is developed from two different levels, are an top of the other. The fossil branch surface of upper level is completely covered with cave clay and ended with the statue Room filled with the little statues made by the visitors. The lower level is the main gallery which contains the water. You can go through the gallery by foot when the level of water decreases. The three small pool, can be, passed by transition technique or by boat. The Statue Room and the natural rock sculptures are worth to be seen. The cave is located 500m south-west of Çamlik Village in Beysehir-Konya. It can be arrived by stabilized way.The total length of cave is 1250m. and Uzunsu River is passing from inside of Körükini Cave after leawing the cave Uzunsu River pass from Degirmen Valley and reaches to Degirmenini Cave. The cave is completely active so that to pass the river, especially the parts where is waterfalls between rock blocks, and to use boat needs experimentation. Summer and autumn is more adviesable to enter the cave. In spring, it may be dangerous because of water and siphons. The cave is located 500m. south-west of Çamlik Village in Beysehir-Konya. It can be arrived by stabilized way.After leaving the Körükini Cave, Uzunsu River pass from Degirmen Valley, whose length is 100m, and reaches to Degirmenini Cave. The river, passes between huge rock blocks occuring waterfalls while the cave goes as very wide and high gallery and after 150m. it reaches to Büyük Lake. It goes 150m. 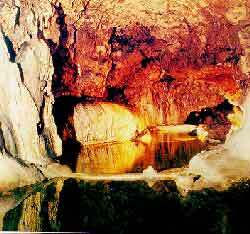 with lake and then with an entrance which has a hight of 30m., the cave reachs to earth. The depth of lake is high and can be passed by boat easily. It is near to Seydisehir Town of Konya City. The cave could be reached through Seydisehir, Süleymaniye Village and Mortas road. It is a vertical cave which has 303m. total depth. The cave is at Susuz Village which is between Seydisehir-Mortas. This active cave has two entrance which are a narrow horizontal hole and vertical (-60m) pit. Its length is 2000m. The cave need boat through the all seasons. Especially in the spring it could be dangerous to pass without experiance in active caves. On the camp side, it is difficult to find the water. That’s why it is adviced to bring extra water from Susuz Village. One can reach to cave from Konya-Beysehir-Seydisehir through the Mortas Aluminium Company.The total length is 1650m. and depth is 65m. it is located south-west slope of Tinaztepe. The cave is developed from two parts fossil and active. If one will go to fossil part in spring,have to pass 5 lakes by boat. In autumn the level of water decreases so that the same gallery can be passed by foot. After the last lake the cave reaches to Great Hall with a descend of 30m. This hall is ended with a lake. 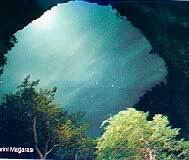 Tinaztepe Sinkhole is located beneath the Tinaztepe Cave. The total length of sinkhole is 1550m. and depth is -150m. The water falls down to düden during the year. With a vertical pits of 20m. one can enter the cave from the side of waterfall. The Pinarbasi Cave is in Pinarbasi Village located at south-west part of Kizilova Polje at the south of Beysehir Lake. The cave is mostly horizontal. A karstic spring is discharged from the cave. There are many lakes and siphons in the cave. There are many lakes and siphons in the cave. On the other hand cave is very rich of dripstone formations. The cave is in Derebucak district of Konya Province. It is at the 18th km. in the direction of Ibradi from Derebucak after Konya-Beysehir-Derebucak road, and it is situated at the west side of Kembos Plain. Kembos Plain with a width of 1km and a length of 15km drains the snow water melting in the spring and especially the water accumulated here via Uzunsu Creek by means of Feyzullah sinkhole, another chasm. Water sinking from these points is added to Manavgat Creek by passing through Altinbesik Düdensuyu Cave. Although the cave does not have a touristic importance, it is important regarding the speleological aspect. There exists numerous lakes, big halls and siphons in this sinkhole which has a length of 714 meters. That sinkhole is very close to Derebucak Village of Beysehir Town. That active sinkhole drained Gembos Polje at spring seasons. and functioning as a bridge on the underground creek. The base of the hall, which has a height of 60 meters and a length of 70 meters, is covered with a ther Göksu under the travertine formations of the area is 500m. long and where the water sinks the cave ends with a siphon. At the exit mouth of the cave, a part of Göksu river comes out of the cave. While it makes a marvelous natural miracle and Göksu river than continues rest its with deep and blue lakes. It is situated at Ballica village which is about 5km. away from the district of Pazar town of the province of Tokat. The cave is located on the side of Indere valley and starts with a fossil opening at the height of 1180 meters. General morphologic constitution shows large halls created as a result of collapses and connected to each other with passages. Especially at the hall with bats and the hall following, the floor of the halls are not clear because of guano which covers the collapsed blocks. In order to be able reach to these halls, vertical speology technics must be used (there are 10m. and 7m. length descents). Inside the cave which has almost completed its development process and especially at the large hall there are many interesting structures such as columns with lengths over 10 meters, travertines with like mushroom caps, and what is more important are the onion like structures with sizes starting from 30cm up to 7 meters. Furthermore, a very spread bat population could be seen. On the other hand, the entrance of the cave is not protected by any way and means and so necessary action must be taken for proper protection against any harm which could come from people around or people visiting the place. While the creeks and inner lakes are passed easily by walking, sudden flood occurs during big rains. Because of this danger, it is proper to enter this cave in summer and autumn. The cave which is situated in Kizil Elma quarter of Ayiçi Village of Gelik District of Zonguldak Province can easily be reached by cars. Water of Aydin Creek and Büyük Ay Creek sinks at the active inlet. The cave is entered through the fossil inlet (30x10m.) located at the upper part, and after 100 meters water is met. The cave continue horizontally together with the water. After the first 100 meters, it is possible to go by creeping for 400 meters, a siphon of 10 meters exists. This siphon can be passed in the Autumn. The gallery in the cave has great dimensions after the siphon. At the 3200th m. of the cave which continues as a single active gallery basically, there is a chimney with the height of 80 meters which is enough to illuminate the lake at the base.The cave continuing 3 kms along with the lakes ends with the 2nd siphon. The researches related with some branches and the last siphon in the cave has not been concluded, yet. 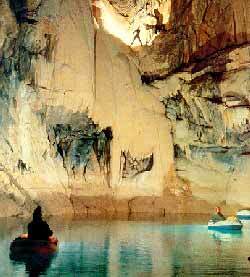 It has been determined via the researches carried out by paint experiments that the sunk water appears in Cumayani Cave after 2 kms. Thus, the total length of the underground system (Kizilelma-Cumayani) reaches to 10kms. Once, it was the longest cave system of Turkey. However, when it has been discovered that Pinargözü Cave has a length of 12 kms in 1991, this cave has been placed in the 2nd order. 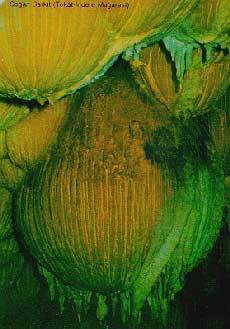 Its siphons, areas of cripping, lakes and funnel of 80 meters are the characteristics, or perhaps the most exciting aspects of the cave. As there is a danger of flood in the rainy periods, the season and the weather forecast should be taken into consideration while entering the cave. It is situated in Cumayani quarter at 3 kms. distance from Çatalagzi district of Zonguldak province. 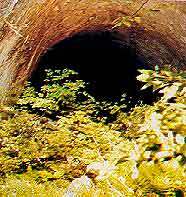 It forms the outlet of Kizilelma-Cumayani underground water system. It is opened to outside with many inlets. The hall is reached through a active gallery of 100 meters from the lower inlet or by walking for 75 meters from the upper fossil dry inlet. The hall begins with a travertine offering an extraordinary beauty and functioning as a bridge on the underground creek. The base of the hall, which has a height of 60 meters and a length of 70 meters, is covered with a thick sand layer and ends with a siphon. Upon going in the direction of water entrance to the left of the travertine, the siphon is reached in the direction of Kizilelma Cave. A boat is necessary in this gallery. As flood occurs in the rainy periods or at the times of a sudden rain, there exists a danger of life. Because of this, one should be careful. It is at 1km. distance from Çayirköy which is 3kms. north of Güdüllü Village at the 10th km. of Zonguldak-Çaycuma road. Sofular and Egridere streams sinks at Çayirköy Cave inlet, continues underground for 1004 meters and drains from Çayirköy. The inlet begins with a vertical fall of approximately 30 meters and then reaches to the siphon. The siphon can hardly be passed at the times when the water level is low. After this point, the cave continues horizontally together with the lakes, and there exists a deep lake at the end of it. It is a cave situated in the city of Zonguldak province at the sea coast at the 15th km of Kilimli road. The entry to the cave with a total length of 800m is made from the fossil inlet facing the sea. After a hole one man can hardly pass at the 50th meter it continues sporadically with fossils and rich formations and sporadically with an underground creek. There exists a siphon at the 400th meter, and it can be distinguished by walking in the period when water is drawn. From here, it ends with the siphon after 400 meters. Mencilis cave is near Bulak village of Karabük town of Zonguldak city. It takes probably 1 hour from village to the cave by walking. The cave has two entrance. The first of them has water discharge and ends with a siphon 30m beyond cave entrance. The second entrance is on the neighbor gorge of the camp place and that part is inactive. 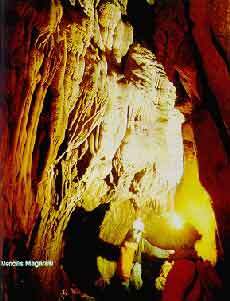 Mencilis cave whose total length is 2725m has four vertical pit which are 3,5,11 and 15m. in deep. Inactive section has a main and a secondary passage which called “Fareli Kol”. To be reached to the active passage after descending 11m pit. The most beautiful part of cave is in that part. 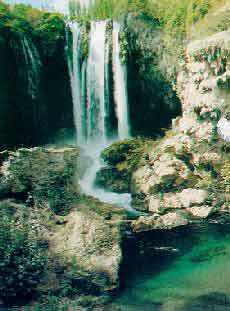 The delicate travertine formations of upstream hall and the 15m high downstream cascade are worth to be seen. Hizar cave is close to Safranbolu town of Zonguldak city. It is a horizontal and inactive cave. It has a big entrance and a big channel which has three passage. There is a lake shape siphon at the secondary passage of the first passage. There is a water discharge from a siphon which is at 50m down altitude from cave entrance. It is jointed to that part with a vertical pit. As a result of a research made by the Ministry of Tourism, studies have been carried on the caves in the Mediterranean and Aegean sea costs and sketches have been made out.